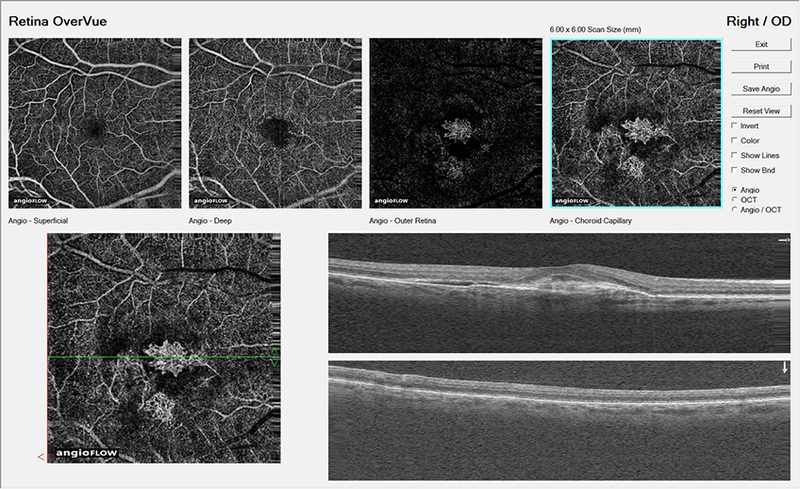 OCT-ANGIOVUE (OCTA) system is a non-invasive and dyeless technique for evaluating physiologic components of the retina providing high resolution visualization of the vascular structure in three dimensions. Capturing the dynamic motion of the erythrocytes (red blood cells) allows a 3D visualization of the perfused vasculature and micro vasculature of the retina. This is the first of its kind on the Balkans, where the injection of dye is not necessary as same as Fluorescein angiography. It is safety for patient and it can be repeated as many time as it is required. Angiovue is very useful for evaluating macular degeneration, particularly at wet form, diabetic retinopathy, arterial and venous occlusions, inflamatory diseases, glaucoma etc.